Most of the provinces take their name from earlier duchies and counties of similar location, while their territory is mostly based on the departments installed during French annexation. At the time of the creation of Belgium in 1830, only nine provinces existed, including the province of Brabant, which held the city of Brussels. In 1995, Brabant was split into three areas: Flemish Brabant, which became a part of the region of Flanders; Walloon Brabant, which became part of the region of Wallonia; and the Brussels-Capital Region, which became a third region. These divisions reflected political tensions between the French-speaking Walloons and the Dutch-speaking Flemish; the Brussels-Capital Region is officially bilingual. The division into provinces is fixed by Article 5 of the Belgian Constitution. The provinces are subdivided into 43 administrative arrondissements, and further into 581 municipalities. Map of the Seventeen Provinces, red showing the border between the independent (Northern) Netherlands and the Southern Netherlands. The medieval Low Countries, including present-day Belgium, the Netherlands and Luxembourg, as well as parts of modern Germany and France, comprised a number of rival and independent feudal states of varying sizes. These each had their own identities and governments, though in the early modern period almost all the Belgian states became part of larger entities (the Seventeen Provinces (1549-1581) and the Southern Netherlands (after 1581)). 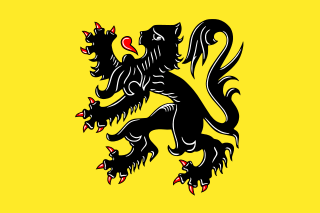 Prominent early states in the area of modern Belgium included the Duchy of Brabant, the County of Flanders, the Prince-Bishopric of Liège and the Duchy of Luxembourg; smaller ones included the County of Hainaut, the Duchy of Limburg and the County of Namur, though there were other small states as well. When these territories were annexed by France in 1795, they were reorganised into départments; the borders were redrawn and the historical names were replaced by names of geographical features (generally the main river of the area). At the end of French rule and the creation of the United Kingdom of the Netherlands in 1815, the departmental territories were generally retained but were renamed into provinces and the historical names returned. At the time of the independence of Belgium from the Netherlands in 1830, Belgium's territory simply consisted of the existing nine southern provinces. The first article of the Belgian Constitution said: "Belgium is divided into provinces. These provinces are Antwerp, Brabant, West Flanders, East Flanders, Hainaut, Liège, Limburg, Luxembourg, Namur, except for the relations of Luxembourg with the German Confederation." As such, each of the modern provinces of Belgium (with the exception of Antwerp) takes its name from one of the medieval predecessors, whereas the borders largely correspond to those of the French departments, which in most cases differ substantially from the historical entities. In 1839, as part of the Treaty of London, half of the province of Limburg became part of the Netherlands, which consequently has its own province of Limburg. In 1920, following the First World War, Belgium annexed the Eupen-Malmedy territory, which became part of the province of Liège. During the second half of the 20th century, Belgium transitioned from a unitary state to a federal state with three Communities and three Regions. 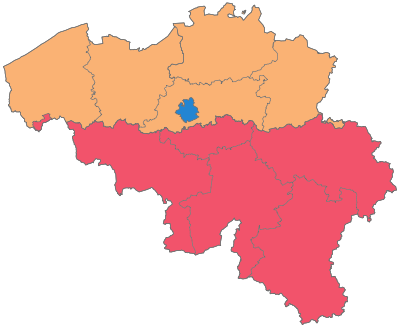 As part of the state reforms, the (bilingual) province of Brabant was split in 1995 three ways: into two (unilingual) provinces (Flemish Brabant and Walloon Brabant) and into the (bilingual) Brussels-Capital Region. (The Brussels-Capital Region does not belong to any province, is not a province, and does not contain any provinces.) The two new Brabant provinces became part of the Flemish Region and the Walloon Region respectively. The remaining eight provinces became part of these regions as well, so the Flemish Region and the Walloon Region each contain five provinces. The following table presents a simplified overview of the evolution of the French departments into the present-day Belgian provinces. The provincial government consists of three main branches: the Provincial Council, which is the elected body, the Deputation or Provincial College, which is the executive body, and the Governor, who is appointed by the regional government (i.e. the Flemish or Walloon Government). The Provincial Councils (Dutch: Provincieraad; French: Conseil provincial) are the representative bodies of the population of the provinces. This is the equivalent of the States-Provincial in the Netherlands. The numbers of seats in the Provincial Councils are proportional to the population of the province; the numbers were reduced in both Flanders and Wallonia, starting 2013 (following the 2012 elections). They are directly elected each six years, at the same time of the municipal elections. Before 1994, the provincial elections instead coincided with the national elections. Until then, the provincial councils also appointed Provincial Senators to the Belgian Senate. The last elections were held on 14 October 2018. The executive branch was previously called the Permanent Deputation. In the Flemish Region it is now simply called the Deputation (Dutch: Deputatie) and it consists of the Governor and six Deputies elected by the Provincial Council from among its members. Following the next 2018 election, there will be one Deputy less, i.e. five Deputies. In the Walloon Region it is called the Provincial College (French: Collège provincial) which consists of the Governor and four to five Deputies (depending on the number of inhabitants of the province) elected by the Provincial Council from among its members. In Flemish Brabant, there is also a Deputy Governor (Dutch: Adjunct van de gouverneur). The Deputy Governor is appointed by the Flemish Government on the unanimous advice of the Federal Council of Ministers and must have a considerable knowledge of both the Dutch and the French language. He is responsible for ensuring that the language legislation is observed in the municipalities in the Brussels Periphery. Following the Fifth State Reform, the responsibility for the provincial institutions was devolved to the Regions. The Regions have the power to amend or replace the existing legislation on the provincial institutions, most notably the Provincial Law of 30 April 1836. In the Flemish Region, the Provincial Decree of 9 December 2005 applies. In the Walloon Region, the Code of Local Democracy and Decentralisation applies. The legal framework in these Regions is still very similar, but that could change in the future. Although the Regions are responsible for the provincial institutions, the Federal State has retained its responsibility over the provinces in certain cases. For instance, the Regions are responsible for the appointment of the Provincial Governors, but only after the unanimous advice of the Federal Council of Ministers. Legislation regarding the Governor and Vice-Governor of Brussels-Capital, and the Deputy Governor of Flemish Brabant, has also remained a federal competency. The Brussels Region in Belgium. The Brussels-Capital Region does not belong to any province, nor does it contain any. The extraprovincial status of Brussels has existed since 1995, when the former province of Brabant, which had Brussels as its capital, was divided into the Dutch-speaking province of Flemish Brabant and the French-speaking province of Walloon Brabant. Within this mainly French speaking region, nearly all former provincial competencies are assumed by its regional institutions and by the French Community Commission, the Flemish Community Commission or the Common Community Commission. However, the Arrondissement of Brussels-Capital has two commissioners of the Federal Government who are called "Governor of the Brussels-Capital Region" and "Vice-Governor". The Governor exercises most of the few remaining powers elsewhere exercised by a provincial governor, particularly in the field of public order, as far as no (federal) law, (regional) decree, ordinance or decision states otherwise. The Governor is appointed by the cabinet of the Brussels-Capital Region on the unanimous advice of the Federal Council of Ministers. The regional government also appoints the Vice-Governor, who must have a considerable knowledge of both the French and the Dutch language and who must ensure that the legislation regarding the use of languages is observed in Brussels. Because the German-speaking Community is located entirely within the province of Liège, it has been proposed on multiple occasions to create an eleventh province, the Province of Eupen-Sankt Vith, which would comprise the nine municipalities of the German-speaking Community. Most of the functions carried out by provincial organs would then be exercised by the organs of the German-speaking Community. The community is however small in area (854 km2 or 330 sq mi) and has only about 76,000 inhabitants, which would make it the smallest and by far the least populated province. ^ a b c d "Province of Belgium". statoids.com. ^ "Oost-Vlaanderen: feiten & cijfers". Provincie Oost-Vlaanderen. Archived from the original on 2006-11-11. Retrieved 2006-10-06. ^ Proposal for an ordinance, stating the Governor's powers for the "arrondissement Brussels", the latter should be seen as the part of the arrondissement Brussels-Halle-Vilvoorde that is not part of the Flemish Brabant province. ^ "Factsheet on the Provinces" (PDF). The Belgian Chamber of Representatives. Archived from the original (PDF) on 2007-09-27. Retrieved 2007-06-22. ^ Ferdy Willems and Danny Pieters (21 March 2000). "Proposal of Law creating the Province of Eupen-Sankt Vith and a German-speaking electoral circle for the elections of the Chamber of Representatives and the Senate" (PDF) (in Dutch and French). The Belgian Chamber of Representatives. Retrieved 2007-09-02. ^ Jan Loones (VU) (13 July 1995). "Proposal of Law granting all provincial competences to the organs of the German-speaking Community and on the representation of the German language area in the Legislative Chambers" (in Dutch). The Belgian Senate. Retrieved 2007-09-02. Wikimedia Commons has media related to Provinces of Belgium. Voeren is a Flemish municipality located in the Belgian province of Limburg. Bordering the Netherlands to the north and the Walloon province of Liège to the south, it is geographically detached from the rest of Flanders, making Voeren an exclave of Flanders. Voeren's name is derived from that of a small right-bank tributary of the Meuse, the Voer, which flows through the municipality. The Arrondissement of Brussels-Capital is the only administrative arrondissement in the Brussels-Capital Region in Belgium. Because it is the only administrative arrondissement in the Brussels Region, its territory coincides with that of the latter. The Court of Appeal in Belgium is a court which hears appeals against decisions of the Court of First Instance and the Commercial Court. Unlike the Court of First Instance, the Court of Appeal isn't divided into different divisions. There are five Courts of Appeal in Belgium. Each Court of Appeal hears appeals against the decisions of the Courts of First Instance and the Commercial Courts of the judicial arrondissements within its jurisdiction. The Court of Appeal doesn't hear appeals against decisions of the Labour Court. Decisions of Labour Courts can only be appealed against to the Court of Labour. This is a list of windmills in Belgium. Belgium is divided into three regions, two of which are subdivided into five provinces each. The NIS code is an alphanumeric code for regional areas of Belgium. This article lists Belgian provinces and regions by gross domestic product (GDP).